Set aside 4 plums, halved. Toss in a teaspoon of olive oil and teaspoon of sugar. Set aside (These will be grilled). Heat oil in a skillet, add chopped shallots and turn down heat to medium low. Sauté shallots until soft and translucent. Add the pitted plums and the rest of the ingredients and cook until the plums are soft and their juices have been released. About 5-10 minutes. Puree in a blender or food processor. Let cool slightly and adjust seasoning for salt, sugar and wine. Make the quinoa salad. It can be made one day ahead. Bring water and quinoa to a boil, turn down low and cook for 10 minutes. Pour water and quinoa through a strainer. Rinse quinoa with cold water. Set quinoa in strainer over a pot with 1-2 inches of boiling water, making sure the water doesn't touch the quinoa. Wet a non-terry dish towel with water and wring out thoroughly. Lay dish towel over the quinoa cover with a lid and cook for another 10 minutes. Lay quinoa out on a sheet pan and let cool. The quinoa should be fluffy and not sticky or clumpy. When cooled add the rest of the ingredients to the quinoa. Refrigerate until ready to serve. In a small bowl toss the halved plums in olive oil, salt, pepper, a little sugar and fresh thyme sprigs. Prepare the grill. Grill the mushrooms gill side first, for 3-5 minutes, brushing with the plum glaze. Then turn over and grill the other side and brush with glaze. Add the plum halves, cut side first for 2-3 minutes then turn. The skin may stick to the grill. 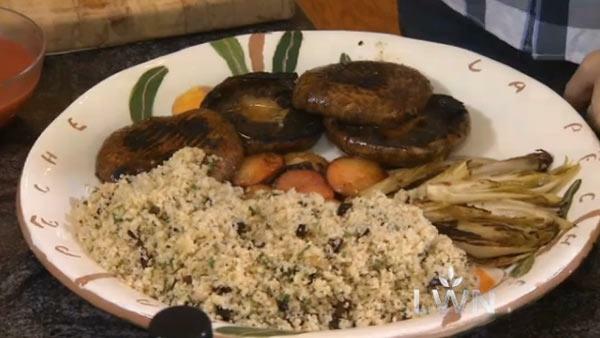 Serve the mushrooms with the quinoa salad and grilled plums with the extra glaze over all. Put the shallots in a bowl with the vinegar lemon juice and salt and let sit for 10-15 minutes Then add the Dijon mustard and whisk in the olive oil but do not emulsify. Add one twist of fresh ground black pepper. Let sit.